Gov. 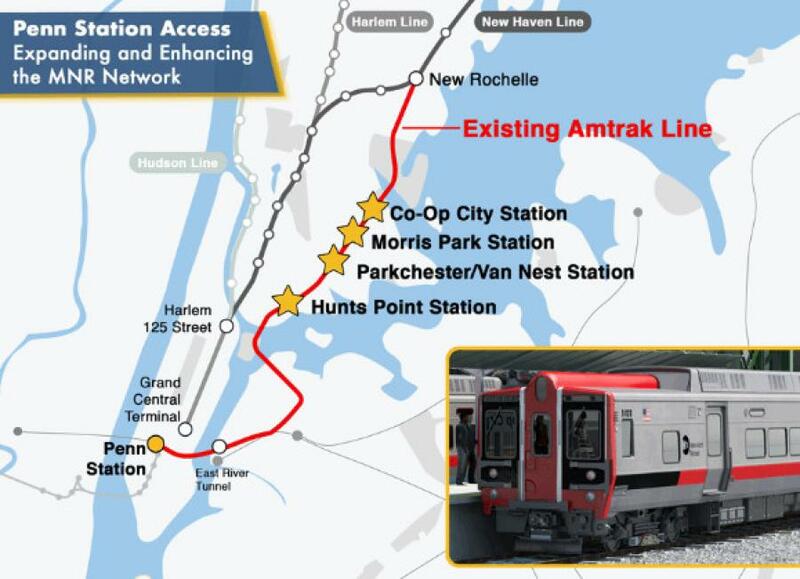 Andrew M. Cuomo announced that an agreement has been reached among the MTA, Empire State Development and Amtrak that will lead to four new Metro-North Railroad stations being built along an underutilized rail line in the east Bronx with access to Penn Station. The parties signed a memorandum of understanding allowing the transformative project to move forward, providing a much-needed transit option and dramatically reducing commute times for many Bronx residents. Empire State Development Corporation is going to work with the MTA to do the planning and expedition of the project, which will help unleash a new generation of economic development for the Bronx. As part of the agreement, Amtrak and MTA will jointly study the feasibility of Amtrak running several trains daily from Long Island to Penn Station and continuing either north to Boston or south to Washington. "Too many residents of the Bronx have been without reliable transit, which is why I proposed these new stations," Cuomo said. "With a reconstructed Moynihan Station currently under way, these four stations not only will connect the east Bronx to Manhattan's West Side, but also build upon our ongoing efforts to fully transform our state's transportation infrastructure. I want to thank the Empire State Development Corporation for their assistance in the expedition of this project to unleash a new generation of economic development in the Bronx. I also want to thank Amtrak for their agreement." Acting MTA Chairman Fernando Ferrer said, "Bringing Metro-North service to the east Bronx is a game changer for the borough, and we have all been eager to get started. This project will significantly reduce travel times for east Bronx residents and help area businesses and institutions attract employees. This is a long-held dream of mine and hundreds of thousands of Bronxites. Needless to say, we salute Governor Cuomo's leadership with Amtrak to let the MTA get this project moving." During a meeting of the MTA Board's Metro-North Committee this morning, the committee approved the $35 million contract with HNTB New York Engineering and Architecture for preliminary engineering and design of the project, known as Metro-North's Penn Station Access project. HNTB will advance the preliminary design, while developing project schedule and construction strategies. Work also will include analysis of options for train operations along the line, finalization of track alignments and community outreach work. In addition to the preliminary design services, the contract contains options for different construction methods. In addition to dramatically reducing commute times of East Bronx residents, bringing Metro-North trains to Penn Station will substantially expand the labor pool for employers in the east Bronx, such as the medical complexes in the Morris Park area, and also will provide commuting opportunities for Bronx residents to work in Westchester County and Connecticut. The MTA expects to issue a "Notice to Proceed" to HNTB within weeks, at which point work on contract services will begin. A more specific schedule for the project will be developed as design work progresses.